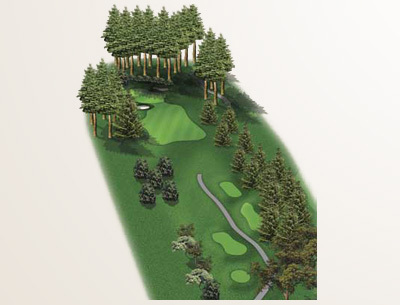 The Royal Colwood Golf Course offers members and guests 4 sets of tees to provide a good test of golf. 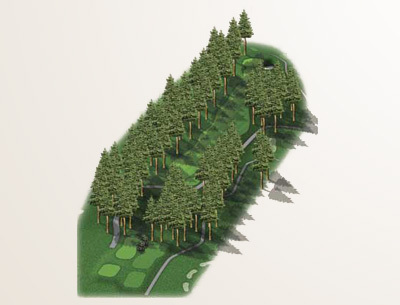 Each set of tees can provide a challenging test to the golfer based on their ability. While the course offers challenges it is still an easy course to walk, and Royal Colwood members, young and old, still predominantly prefer to enjoy their course on foot. A round of 18 holes normally takes just less than 4 hours to complete. 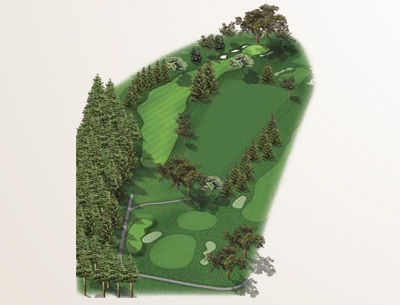 Originally laid out in 1913, Royal Colwood has remained basically the same in layout since that time. The course architect, Mr. A.V. Macan, apparently did his job rather well, to the delight of the thousands of golfers who have played at Royal Colwood. 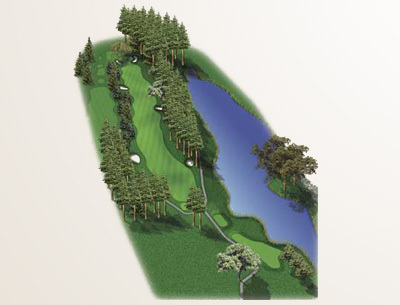 The opening hole usually plays as a drive to a generous fairway and a mid to short iron in to the green. However it is often made more difficult by the prevailing wind which generally blows into the player from left to right. The green is sloped heavily from the back right to front left; making an approach shot that is short and left of the flag ideal. 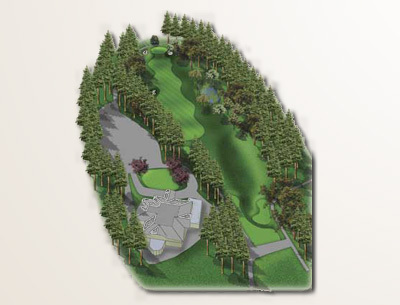 The tee shot is exposed to the prevailing winds that funnel through the trees bordering the fairway. The second shot however is not so affected as the two-tiered green sits in a somewhat sheltered bowl. 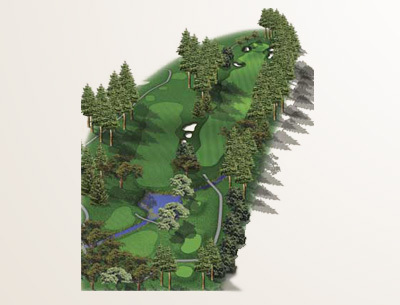 Be wary of missing to the left side, as the embankment can send a ball into big trouble. Short and sweet is the safe play here. 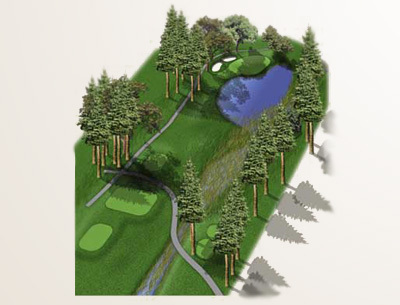 One of the tougher holes on the course, due to its length and the creek running across the front of the green. Short to average length hitters should consider a lay up here. An aggressive strategy on this hole can lead to an early round blemish. The first of four par threes requires you to trust your yardage. Anything right is wet, and the two bunkers to the left of the green present a difficult downhill shot back towards the water. The green slopes from left to right and is bigger than it looks. Trust your swing and take dead aim at the center of the green. 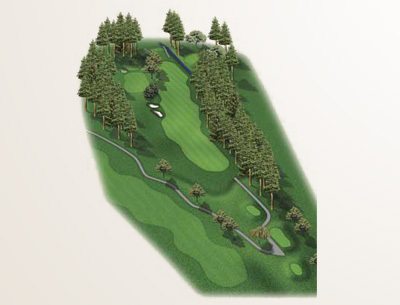 With only two par fives at Royal Colwood, longer hitters here need a well controlled fade to get into position to have a chance at reaching the green. The green is very narrow at the front requiring a long straight second to get on. For mere mortals, this is an excellent three shot hole where keeping the ball in play from tee to green will result in a good score. A truly beautiful golf hole. Drive it straight down the middle and play a mid iron to long iron into the middle of the big flat green. 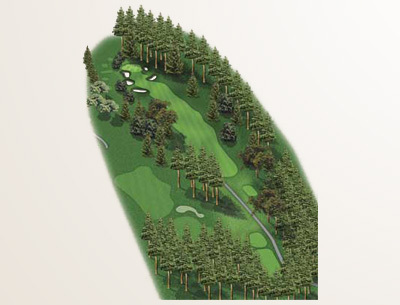 Lined by large trees, this hole can visually intimidate you if you don't pick your target. You can't see the bottom of the flag for your second shot, so trust your yardage. A mid to short iron here to a long green that requires a well-directed shot. Missing left here usually leads to trouble worse than a shot that ends up in the bunkers on the right. Taking an extra club and ensuring a straight simple tee shot here will pay dividends. 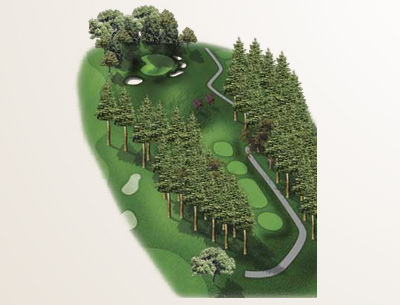 The oaks to the right leap into the fairway and a driver will need to be exceptionally long and straight to avoid them. Otherwise a precision lay up to the left-center 100 yards out is ideal. From here good wedge play will yield birdies. The green is long, and will break left quickly in the middle section. 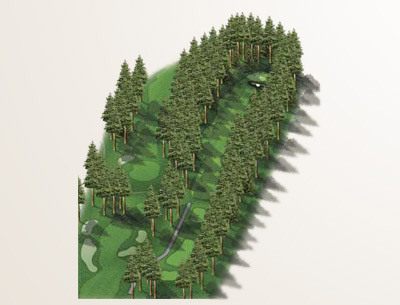 The fairway narrows the further you hit it, but don't hit it far enough and the big green gets small very quickly. 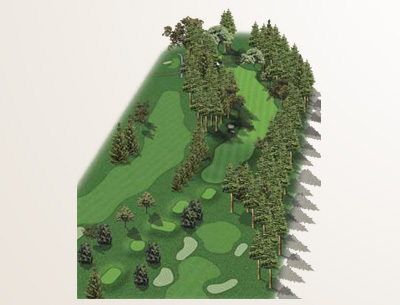 Left of center from the tee will offer a good line for the second shot to avoid the cedars on the right. An extra club will get you up on the green nicely. The greenside bunker on the right is definitely there, you just can't see it. Avoid the temptation to cut the corner here. The line for the tee shot is the Garry oak through the fairway. The approach can lull you into error, its appearance is deceiving. Play a well struck shot to the center of the green and putt to the hole from there. Getting cute with the surrounding bunkers is asking for trouble. Don't let the majestic beauty fool you here. 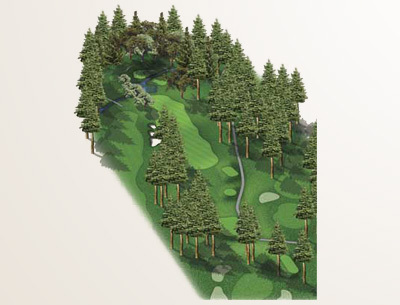 This is a beast of a par three. 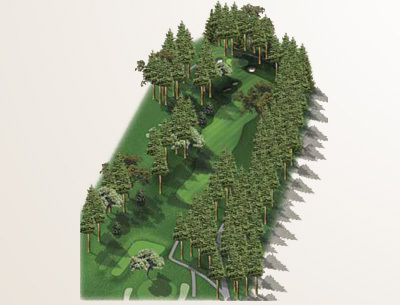 A fairway wood, hybrid, or long iron is needed, and a right to left shot is the order, as the huge trees to the left will catch anyone trying to fade a ball into this green. Take lots of club and if you walk off with a par, you have done really well. 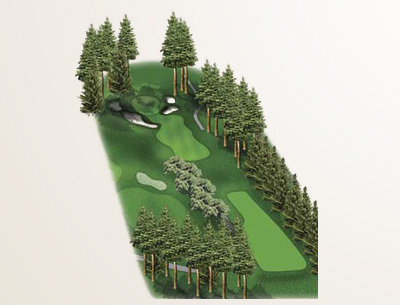 Aim at the opening in the trees on the horizon, which frame the fairway and your ball should kick slightly to the right-center of the fairway, giving you more room to thread your long second through the firs onto a green that is notorious for its treachery. Sloping from back left to front right, an approach that carries the false front and ends up below the hole will keep the nerves from twitching near the cup. Accuracy off the tee is premium on this par 4. With water in front of the green, a tee shot missing the fairway usually results in a heroic second or a chip to safety. Above the hole here? Don't sneeze. You thought the last green was quick. The front half is divided into two sections, left and right. Try to land in the correct one if the flag is on the front. The tee shot is key here. 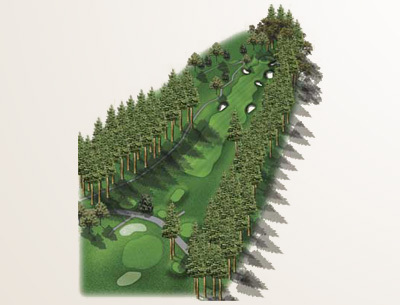 A tee shot that moves left to right onto the plateau will position you well to weigh up your options from there. A long green that runs off at the edges requires strategy on approach. If this hole is out of your reach in two, play conservatively for the first two shots in favour of a slightly longer third. Trouble lurks. Take an extra club, and play left of the hole if you can. This will leave you with an uphill putt and keep you out of the bunkers on the right, which lead to trouble. Bunkers to the left pose less of a threat, and there is more room to this side than you can see. Often you can't feel any wind on the tee-box, use your memory from the last hole to determine direction. Don't be intimidated by the Douglas Firs towering above you as they can act as a side board for an errant drive. 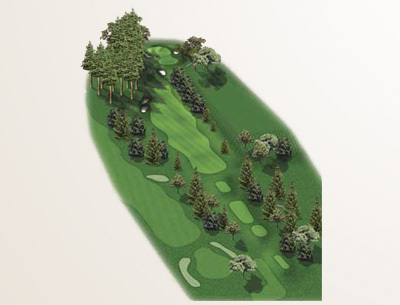 The green is larger than it appears from the fairway and it is important to keep you second shot below the hole. Be sure to check out the plaque at the base of the big fir behind the green; it's five hundred years old. A very demanding tee shot here generally requires a slight right to left drive to one of the narrowest fairways. The left side is trouble, while the right offers a little more room. A mid to short iron approach requires precision, as the green is full of humps and hollows that make life difficult once on the putting surface. The green is protected from the prevailing wind, and second shots often go long here. 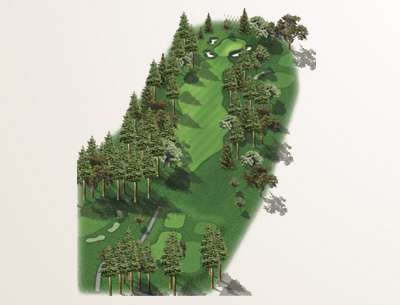 A stout tee shot is required to carry the ridge-line, and the further left you go, the longer you need to carry. Once safely up on the plateau fairway, anything from a mid iron to a hybrid will be needed to get you home. The shallow green has O.B directly behind, so playing to the chipping area in front of the green is the conservative play. Further influencing your decision to under-club, especially when the flag on the right, is the large Garry Oak protecting the right portion of the green.